COOK DAILY//CROYDON BOXPARK – Phoebe Raye. Now, I’ve heard so much about Cook Daily in the past. It’s featured in every vegan based magazine, blog and Facebook post but I’ve never thought to make the journey down to Shoreditch BoxPark to see what all the fuss is about so when King Cook’s second branch of Cook Daily with a new and extended menu was due to open in the newly opened Croydon BoxPark which is literally TEN MINUTES AWAY FROM MY HOUSE, I had to jump at the chance to try. It seemed to take ages to open this branch as will a lot of other vegan food outlets in Boxpark that I’ve been waiting forever for! (What the Pitta, Get Juiced) but on the off chance myself and Tom passed by after a long day and it had opened its doors and was absolutely thriving with people of all backgrounds. 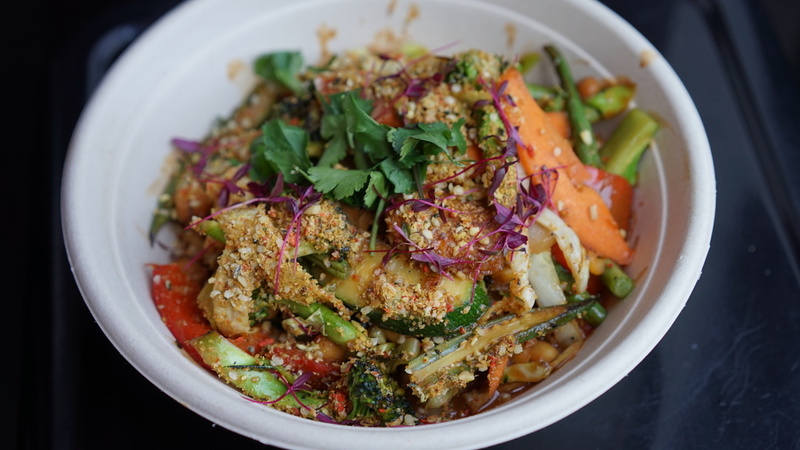 I don’t know of any other vegan restaurants in Croydon so I was quite surprised but speaking with some of BoxPark staff, it is without a shadow of a doubt the most popular food place. A friendly staff member told me he was an omnivore and he always eats there because he finds it amazing that he can finish the whole plate and then only after realise “wow, there was no meat in that!” and I am so grateful for a business promoting a vegan lifestyle to have that affect on people who would otherwise never consider eating vegan. With it being Veganuary, Cook Daily was offering 15% off all month in celebration of the event, so we have been taking full advantage of it. I ordered the YOGA FIRE which is a mildly spicy Indian flavour dish with chickpeas, greens, sweet potato on a bed of a 50/50 mix of brown rice and quinoa. Tom opted for THE JERK with puffed tofu which is a Caribbean dish stir fry again on the delicious, nutritious 50/50 brown rice and quinoa which they usually top with vegan coleslaw. This was my first taste of Cook Daily and once you try it, you will never eat the same again. The flavours were ridiculous! I felt like I had never tasted food before and anything I cook from now on will taste bland in comparison. If you have ever had a dish from Cook Daily, you will know what I’m talking about. I’m addicted! The very next day we both went back and I had the highly recommended House Pad Thai which was full of delicious veggies and scrambled “egg” tofu and Tom tried the Vegan Adobo which is the Filipino dish with rice which you can choose to have with just veggies or vegan chick’n or tofu. The dishes cost £8.50 each (£7.25 during the remainder of Veganuary!) and for that cheap price you get a wholesome, delicious, victimless meal which will leave you full and satisfied without the need for any meat but if you are transitioning, try the vegan chick’n option which you can swap out the tofu for but either is amazing. The whole menu includes 15 dishes from many different cultures including Thai, Filipino, Caribbean and English among many others and if that isn’t enough, you can top any dish you like with fried plantain, sip on a homemade smoothie or shake and take home a bottle of his own cooking sauce. I am planning on having every dish on the menu and I’m going to have such a hard time choosing a favourite but I will continue to post all the dishes so you can see for yourself! Get down to Cook Daily in BoxPark Croydon or BoxPark Shoreditch and give those vegan tastebuds a treat! Pingback: Top 10 Vegan Spots in London – Phoebe Raye.